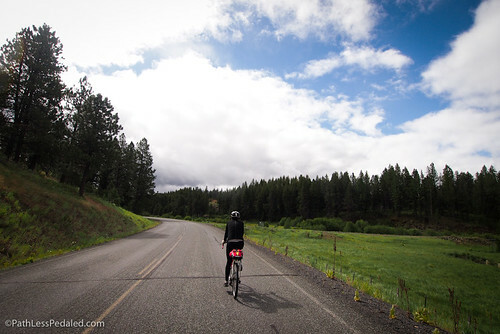 We just got back from about a week in Eastern Oregon filming and photographing the Blue Mountain Century Scenic Bikeway. 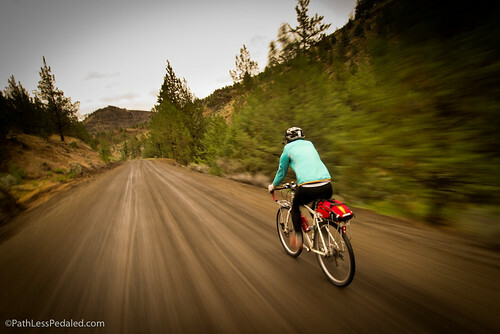 While we were filming in that part of Oregon we were reminded of just how awesome it is for bicycling. The vistas go on forever, the people are friendly and the traffic is low. The Blue Mountain Century Scenic Bikeway is also in very close proximity to the Old West Scenic Bikeway which we filmed almost exactly a year ago. 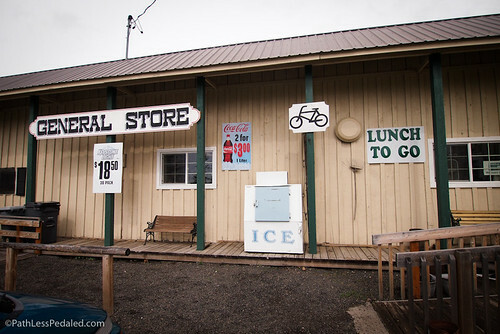 Since we were in the area, we decided to drive the Old West Scenic bikeway (it wasn’t as fun in a car FWIW) and check in on the small towns and businesses along the route. We have to admit, we have a special affinity for the OWSB. Not only was it the first one we filmed, but we also managed to sit in on a county-wide Bicycle Tourism Studio that TravelOregon put on to educate and bring support around the Scenic Bikeway in the area. For us, it was an amazing meeting to witness. We met and chatted people that drove hours and shuttered their businesses to attend. There was so much enthusiasm and hope around the bikeway and the opportunities it would bring. How has it worked out a year later? Apparently, they have had a steady stream of cyclists coming through the last few months. “They eat a lot of ice cream and we can’t keep enough in stock.” Although they didn’t keep an exact account, it was noticeable for a small town of less than 200. 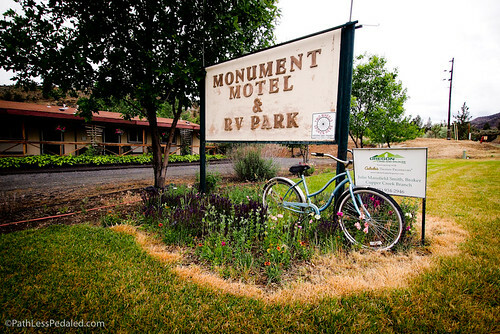 The cyclists often came in pairs or in groups and would sometimes fill the only motel in town. She told us that some community members had even opened up their backyards and bathrooms to cyclists when the motel was full. They had even seen a family with a young child come through to ride the OWSB. Although the current owner seemed a little flustered at the unexpected businesses when she took over for Tammy, she did seem glad to have customers. From Long Creek, we made our way through Monument. Right as we entered town, we noticed that the motel on the edge of town had an old bicycle right next to its roadside sign. I was hoping to run into the Philip, the nut farmer that was in our video but he was out of town. It was heartening however to see that a year later he not only had one but TWO bicycles in front of his building to attract cyclists. We went to the small market in Monument and picked up some food. I noticed that the Scenic Bikeway pamphlets at the entrance of the door. Just as we were leaving town, we noticed two loaded tourists at the town park. I jumped out of the car, perhaps a little too quickly, to ask them about their ride. 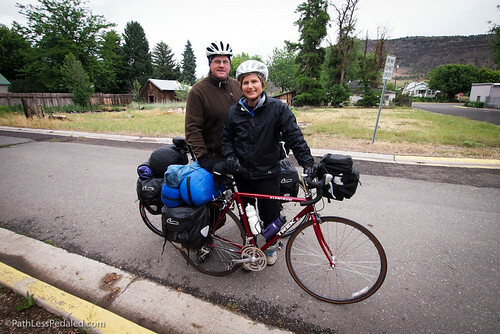 They were a couple from Chicago who had originally planned to ride the coast, but had heard it was too busy and decided to ride the Old West Scenic Bikeway instead. They said that they were enjoying the ride immensely. When I told them we had made the video a year ago, she recognized us and thanked us for helping promote the ride. From Monument, we drove out and decided to camp out at Bates State Park because we knew that there would be a good chance of touring cyclists there. When we arrived, we spotted them with all their tents pitched under the outdoor gazebo to avoid the rain. There were two women from Alaska, a guy from Los Angeles, another from Michigan and a Brit. Although they were riding the TransAm they had noticed the Scenic Bikeway signs and were absolutely loving the riding in Oregon so far. Laura and I made a campfire and invited them over and chatted about their trips. Later that evening we saw a van pull up with a trailer that had two Bike Fridays on the back. Literally every person at the campsite that night (camp host excluded) had a bike and was a cyclist! In the morning we said goodbye to the bike tourists and took our Vayas out on some gravel forest roads in the area. We noticed that the couple with the Bike Fridays were gearing up for their own day ride too. My guess, though I didn’t get to ask them directly, was that they were going to ride some signed portion of the Old West Scenic Bikeway. After our gravel ramble in the forests we drove up to Austin House Cafe, one of our favorite stops along the OWSB and TransAM route. There we shot an interview with the owners Christy and Jeff to see how things have been since we last saw them. 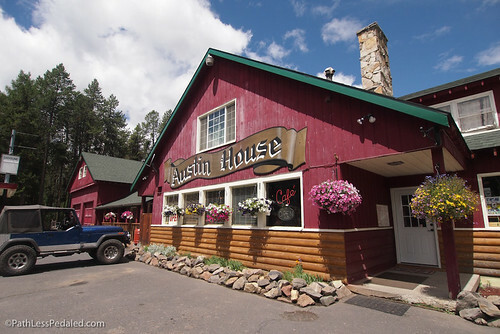 They have operated Austin House Cafe and have been providing awesome service to cyclists for the last 13 years. We’ve heard numerous stories of them opening up when they are closed (Tuesdays and Wednesdays) to cyclists that they see huddled under their porch. 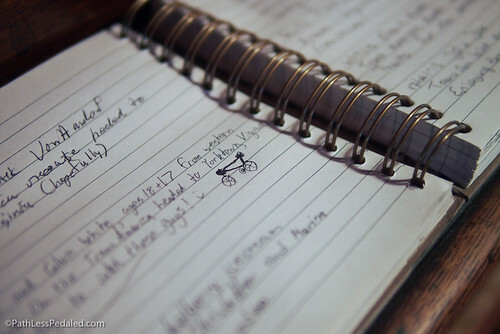 They have a guestbook and encourage cyclists to sign it and are becoming a bit of a destination for bike tourists. In talking to them it was interesting to hear that they have noticed a fair amount of people who are riding the Old West Scenic Bikeway specifically. Another interesting observation was that those that were on the OWSB were more likely to stop and eat than just cross-country tourists. For us, this makes perfect sense having been both cross-country riders and more recreational bike travelers. When you are riding cross-country you have to economize and are probably more likely to pass on certain experiences because of time/budget constraints. When you are doing a shorter loop or more vacation-oriented tour, you are more likely to be leisurely and stop along the way. After some awesome hamburgers and great conversation at Austin House Cafe we pushed off and promised to come visit when we were in the area again. Our next stop was Prairie City. Last year, we had met Rhianna who was operating Roan Coffee Company. She told us about some plans to have a repair station in the shop. It was awesome to see that she had followed through in a big way! Right outside her shop is a big banner that advertises a free repair stand for bicyclists. Not only does she have a repair stand and a pump, but a set of tools, miscellaneous small parts, tubes and tires. 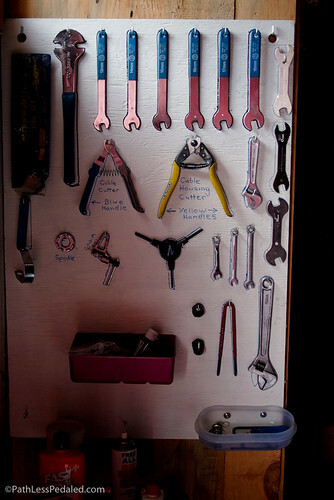 She told me that she worked with Sellwood Cycles to help assemble their repair kit. 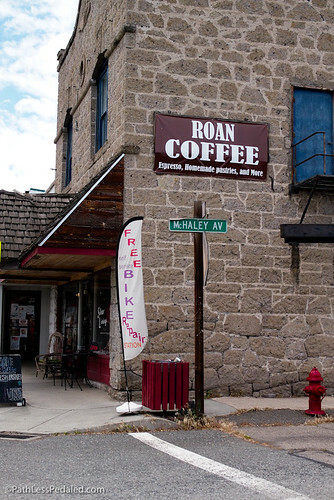 If you’re going through Prairie City on the TransAm or OWSB route, be sure to stop by and grab some pastries and espresso at Roan! This summer marks the first full year that the Old West Scenic Bikeway has been designated and advertised. When we first rode it to film and photograph it, we loved it and knew it was special but wondered if others would make the journey as well. Talking to businesses and people in the small towns along the route it is obvious that it is making a difference. 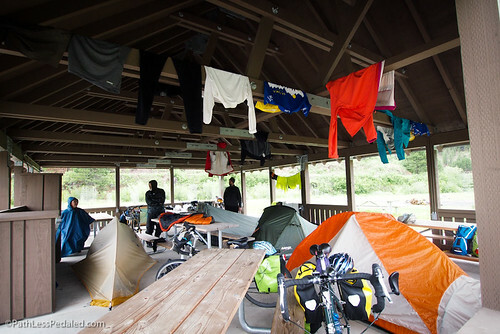 Cyclists are coming out to some of the most remote parts of Oregon to ride their bike and they are spending money buying food and staying in accommodations. Now, no one is making money hand over fist and retiring in a year just yet, but cyclists are starting to discover Eastern Oregon, ride their bikes there and contribute to those local economies. 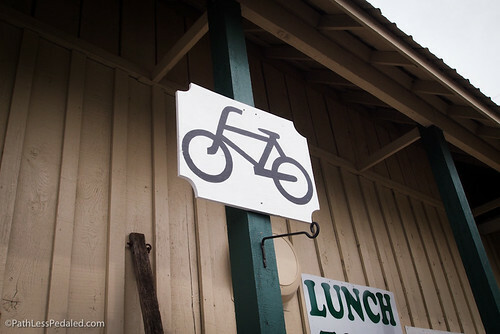 Just as heartening it is to see cyclists in tiny towns like Monument, OR is to see businesses along the way (who aren’t cyclists themselves) put up a bike banner on their wall or leave a bike by their roadside sign. The Scenic Bikeway program is about bridging that urban/rural divide as much as it is an economic development tool through bicycling. The most gratifying moment for us was to run into the couple from Chicago at the town park. It was great to know that the photos and video we created made them want to take the journey out to Eastern Oregon, that they were having an amazing time and were helping some of the small rural businesses along the way. It’s those moments that give us hope that bicycles can indeed save small town America. What a cool ride and wonderful photos. Thanks for sharing. We really enjoyed reading about one of your recent adventures and as always nice to see your pics! Thanks for sharing and stopping to visit with us! Till next time! We’ll be riding the OWSB in mid July. Thanks for the update. Can you recommend a folding bicycle. I know in the past you used a Brompton (don’t know the model). I have a regular road bike, I what something to travel with in my car. It has to be able to make it up some steep hills. I can’t explain it, but this blog post made me cry. I love happy bikey stories. Jolene, don’t apologize–it had the same effect on me! I think it’s hearing that it doesn’t take a huge monumental effort to make a real difference; it just takes a willingness to look at things from a different perspective (like the saddle of a bike) and tell people about it. Laura and Russ are doing great work and we’re working to emulate them in Washington state, which has great riding and incredible growth opportunities in bike travel. 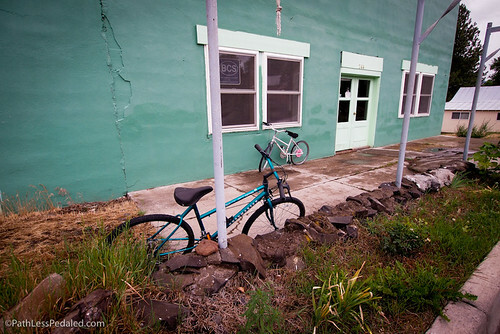 Come bike Oregon AND Washington for quiet back roads, friendly towns, and great ice cream. What an amazing story. Great pictures too. Thank you for sharing about this amazing bikeway. Great article. Thanks for sharing and thank you for the work you do! 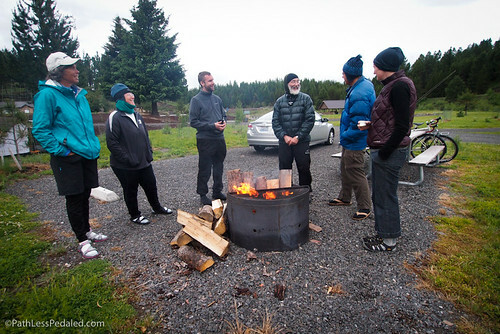 So pleased to hear of your recent trip and how your video helped bring cyclists to Eastern Oregon. It’s also great to see how the businesses have welcomed the new business. 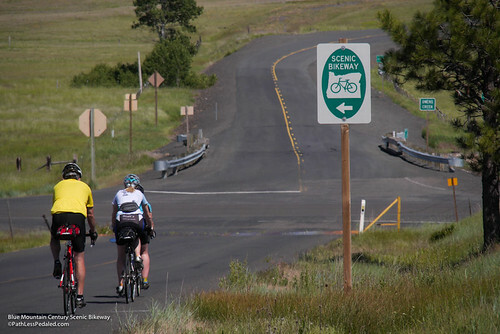 Have you cycled the Grande Tour Scenic Byway, as well? It’s just over the Blues. Russ, I’ve been looking for a 4-5 day solo trip to do in early October. I’m deciding between this loop and a Steens Mountain loop. Any thoughts on either route during the first half of October? I just finished the 173 miles in 3 days it was hilly and lots of headwinds, but that’s what made it an epic journey. I drove over 8 hours from Tacoma to ride this route. 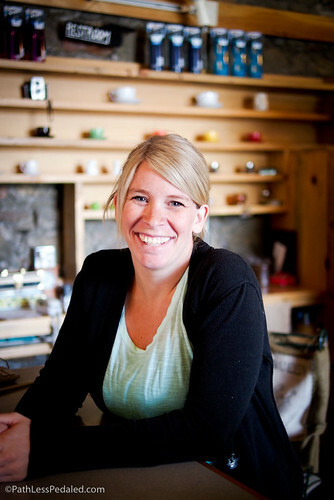 I stayed at the Bike Inn at Mt Vernon and was treated like family, Christy and her family were more awesome. They allowed me to leave my car for 3 days and enjoyed great conversation and food. Everything about this ride that I read about was true. Vehicle traffic was almost zero once you leave hwy 26. I highly recommend this ride to anyone wanting some peaceful and scenic riding. This is great to see. Well done – and thanks for the update! Hope to do this route before long. 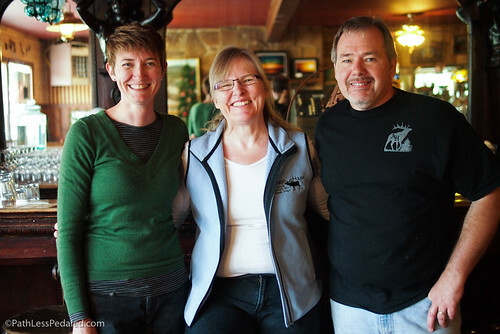 Russ and Laura filmed the Blue Mountain Scenic Bikeway this last summer in Heppner, we are looking forward to a similar story in a year. We have all ready hosted a couple of rides of 20+. Christy from the Bike Inn has taken a couple of different groups on part of it. In mid October a friend and I rode various portions of the OWSB and it and the people were awesome. Great website! We have had a great summer of cyclists not only staying at our lodge here in Long Creek, but some stopping by to say ‘hi’ and making the season special in general. great people over all and we thank you! For your contribution to the local economy and adding such positive energy to the environment. I did enjoy the report. I visited eastern Oregon, Portland, and the costal areas a year ago. It is a beautiful state and more so by bike. Thanks for the story and photos.